Comp Cams Dual Energy camshaft's have a ''split-profile'' design (higher lift/duration on exhaust side). Designed for applications where a slight sacrifice in low end is acceptable for an increase in mid and upper range RPM horsepower. They may be used in conjunction with an exhaust system that is much more restrictive than the intake system. These cams should have no adverse effects on any power or vacuum accessories like power brakes or power steering. The idle quality of these cams are mild enough to run with air conditioning. 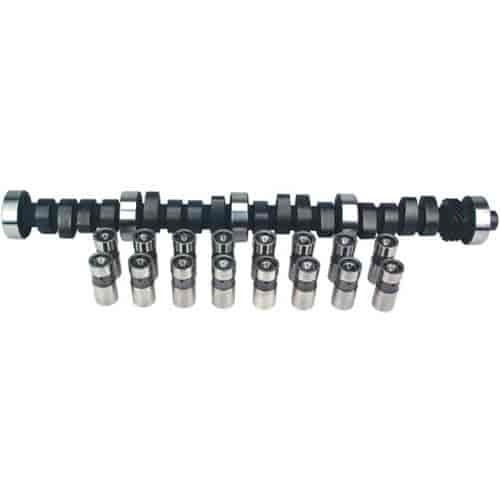 Camshaft & Lifter Kits are indicated by a CL in their part number and include Camshaft, Lifters, Assembly Lube, Decals, and Instructions. Complete Kits are indicated by a K in their part number and include Camshaft, Lifters, Timing Chain & Gears, Valve Springs, Retainers, Locks, Assembly Lube, Decals, and Instructions. Small Kits are indicated by a SK in their part number and include Camshaft, Lifters, Timing Chain Set, Assembly Lube, Decals, and Instructions. Does COMP Cams CL34-223-4 fit your vehicle? COMP Cams 503-16 - Positive Stop PTFE Seals Guide Size: .530"
JEGS 81621 - Precision Cam Degree Wheel Kit 11"